Prosper loans have meanwhile surpassed 66 million dollars loan volume. A look at wiseclerk's prosper loan aging table shows that Prosper.com succeeds in increasing originating loan volume nearly every month. Currently new loans for about 8 million US$ originate each month. However the figures also show an alarmingly high volume for late and defaulted loans. Especially when looking at older loans (the new ones do not have aged enough to be technically able to default). For example of 2.1 million dollar loan value that originated in June last year, $177,000 loan value has defaulted and another $105,000 are 3 or more months late. The default rate for loans from June 2006 will therefore be well above 10 percent at the end of the 36 month term. And this is no execption. 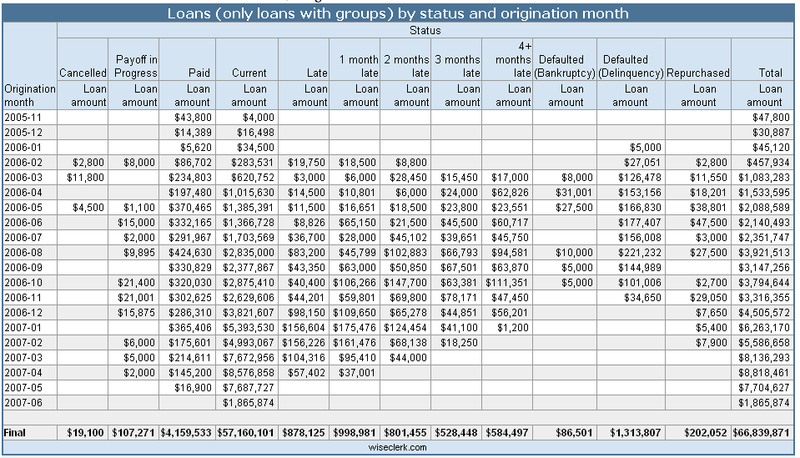 For March and April 2006 defaults are already higher than 10 percent of originating loan value.